For those who consider themselves fans of the “unique” comedy stylings of Jerry Lewis, the arrival of Warner Bros. Home Entertainment’s The Nutty Professor 50th Anniversary Collector’s Edition is a gift from the Gods. For those who are either not fans, or only have a passing familiarity with the comedy legend, this handsome Ultimate Collector’s Edition is in fact, a revelatory tome to make a convincing case of Lewis’ undisputed skill as a writer/producer/director worthy of closer examination. Long has it been the joke to reference Jerry Lewis as a comedian that only the French consider a genius. I was originally of this camp. I grew up with his work from the 1970s and 80s, and couldn’t stand his mugging, his overamplified schtick and sledgehammer style hijinks. My point of reference was Martin Short’s impersonation, playing him as a narcissistic ego-maniac, using his “Buddy Love” persona from The Nutty Professor as a main touchstone. But history will out, and one need only this lavish and extensive package to right the longheld wrong. In the early 1930’s, Adolph Zukor, original founder and President of Paramount Pictures begrudgingly admitted that Mae West, was, indeed, the woman who saved Paramount. Her first starring role in 1933’s She Done Him Wrong rescued the studio from bankruptcy. Paramount’s successor came in the form of Jerry Lewis. In the 1950s, Paramount was again in trouble, but the comedy duo of Martin and Lewis, the biggest moneymaking team in the world, brought in the largest box-offices for the studio. By the late 1950s, when Jerry Lewis was a solo act, his returns were even more monstrous. He was a cultural phenomenon and the undisputed “King Of Paramount” for more than 10 years. According to the front office, Lewis could do no wrong. It’s almost impossible to compare a contemporary star with the box-office clout and appeal that Lewis garnered in the late ‘50s and early 60s. Even Tom Cruise, who was for a time the biggest moneymaker in Hollywood, with a string of hits at Paramount, couldn’t rival Lewis’ international success. But many a Hollywood story includes a chapter on the studio’s resistance to any star, no matter how big, going against the grain and trying something different. The same is true with Lewis’ making of The Nutty Professor. Up until 1963, all of Lewis’ films featured his one persona, the man-boy, an overly simple, well-meaning “kid” who got involved in situations way over his head. From his earliest days alongside partner Dean Martin, he was this character, continuing on through his first solo films. And while Martin initially struggled to find his persona after separating with Lewis, Jerry never lost his footing, and his films became even more successful. So when Lewis started pre-production for The Nutty Professor, the studio was hesitant. Looking back, it seems this film was the furthest from experimentation a comic filmmaker could go. It had the most solid of premises, well-structured story and tightest script he had yet undertaken. While many of his routines in the past could try the viewers’ patience with long takes, letting Lewis milk a joke to the point of tedium, The Nutty Professor is economical, concise and brief. But still, the element that frightened the studio most was that the “young innocent” was nowhere to be seen. He played the two halves of the same person, Professor Julius Kelp and his evil alter-ego, Buddy Love. The two characters allowed him to stretch more than he ever had. As well, the characterizations offered him the opportunity to do some serious acting, pulling pathos out of situations that his idol, Charlie Chaplin, had been doing effortlessly for years. The Nutty Professor tells the story of socially inept, absent-minded, bucktoothed college professor Kelp who yearns for more in life than to be an ignored and ridiculed milquetoast. When a student football player in his class bullies him, the embarrassment causes Kelp to attempt to “bulk up” a la Charles Atlas at the gym, which results in several funny scenarios, but ends up, after 6 months, yielding no results. 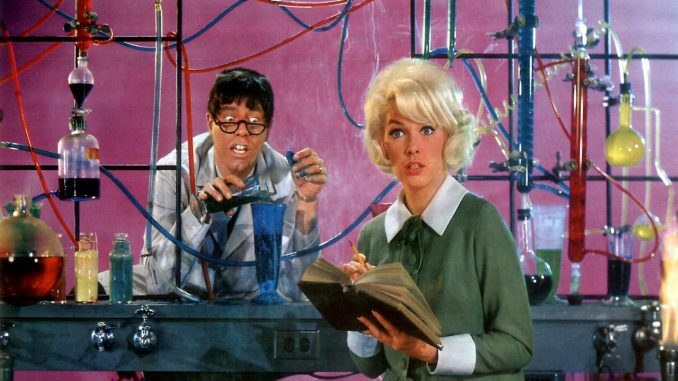 Kelp’s crush on beautiful student Stella Purdy (Stella Stevens), motivates him to seek an answer to his quest for physical and personal perfection via his scientific experiments. He eventually stumbles upon a formula that changes his appearance and personality, but not in the traditional “Jekyll and Hyde” sense that characterizes the Robert Louis Stevenson inspiration for the film. Instead, he becomes the ultimate cool hipster, Buddy Love. He shows up at the local hangout, the Purple Pit, and creates a sensation. He’s confident, suave, and talented, taking to the keyboards to perform a swingin’ rendition of “That Old Black Magic” that sends the student body into a panic. But Buddy Love is also an ego-maniac; a chauvinistic, sadistic bully. He focuses on Stella, and despite all his overbearing short –comings, intrigues her enough that she falls under his spell. Of course, as Kelp continues exploiting his addiction to Buddy Love, he must drink more of the formula in order to maintain his chemical persona, resulting in a final act revelation in front of the school faculty and students. As hilarious as The Nutty Professor is, there’s a heart and soul and modesty to the characters and storytelling absent from Lewis’ previous work. We empathize with the professor, (who of us hasn’t felt socially awkward and ugly, especially during the formative high school and college years?) and understand his search for an alter ego that can “act out” and do all the things he doesn’t have the guts or coordination to do in real life. And Stella Stevens, as “Stella” is also a character “worthy” of Kelp’s obsession and pursuit. She’s not a superficial blonde, but a well written woman with depth and subtlety. It’s apparent she always had a rapport with Kelp as his student, and rebukes Buddy Love even though it seems no other woman can resist him. Yes, she falls under his spell, but his overly aggressive nature is too repugnant for her. And as their “relationship” continues, she becomes more repulsed by him and drawn to the Professor, even though Kelp doesn’t see it. The Nutty Professor’s restoration and print is a thing of eye-popping beauty. You just cannot deny the astounding, vibrant colors. The opening credit sequence alone should be required viewing for anyone who wants an example of the best of the best in Technicolor. And Lewis, the director, takes every opportunity to inject as much color into his frames as possible. The bubbling, steaming, brewing chemicals in his lab are in the deepest, boldest and brightest of blues, reds and yellows. His first transformation slathers color across the lab. His skin changes from opaque to purple to green. The chemicals crash and explode, lining the floors in a spin-art mosaic. The soundtrack is also crisp and beautifully balanced, with music from the big band of Les Brown. One of the highlights is Kelp trying not to be noticed while dancing to a booming rendition of “Leap Frog,” a big band mainstay. The film also gave Lewis the opportunity to sing “straight.” He’d done it before, as with his first solo performance in The Delicate Delinquent. But here, his jazzy vocals, phrasing and intonation are reminiscent of the Chairman of the Board himself. (Many have thought Lewis’s Buddy Love was a parody of his longtime partner Dean Martin which he has consistently denied, but there’s also those, myself included, who can’t help but compare his character to the anecdotal behavior of Frank Sinatra). But beyond the film itself, WBHE Collector’s Edition is a master-class in both filmmaking and Lewis’ directing and producing style during this pivotal point in his career. The set is an embarrassment of riches and includes four discs; the Blu-ray and DVD of the film with documentaries Jerry Lewis: No Apologies, a new feature that takes an intimate look at the artist as he entertains in front of a live audience, Jerry Lewis At Work – which I found to be an invaluable reference to the films The Delicate Delinquent, Rock-A-Bye-Baby, The Bellboy (the first film he directed) and Cinderfella, Behind-the-Scenes Footage, outtakes, screen tests, deleted scenes, promos, a Jerry at Movieland Wax Museum film segment, and audio commentary by Jerry Lewis and good friend Steve Lawrence. And that’s just the Blu-Ray. There’s still three other discs that include the entire film Cinderfella with bloopers and commentary by Lewis and Steve Lawrence, The Errand Boy, also with commentary by Lewis and Steve Lawrence, bloopers, promo spots and a theatrical trailer. The set also includes a Director’s Letter specially written by Lewis to present the collection, “Being a Person,” a 96 page book made up of drawings and quotes written by Lewis, which he put together and distributed to the cast and crew while shooting The Nutty Professor, a 48-page storyboard book and 44-page cutting script with notes. Whew! The final disc, a CD, offers up one of the more surprising features. Jerry Lewis Phoney Phone Calls 1959 – 1972 is an, until now, out-of-print album that features prank phone calls Lewis used to make with the Paramount engineers that he privately recorded. Long before the Jerkey Boys and radio DJs who would on-air prank, Lewis would call different businesses and harass them, always in good-natured fun, allowing us insight into his sharp wit and ability to adlib much better than originally imagined. 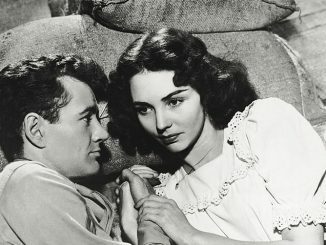 Cinderfella, the second of three films included, was pivotal for several reasons. During production, Lewis suffered a heart attack after rehearsing a scene where he runs up a huge flight of stairs, and was rushed to emergency, halting production. The film was planned as a Christmas release, but when Paramount wanted it instead as a summer film, Lewis fought with the studio, until they agreed it would be pushed back to December only if he made a film quickly for summer. This film was The Bellboy, and it was his first time sitting in the director’s chair. Cinderfella’s story is simply a reverse of the fairytale, where Lewis plays “Fella,” the stepson of evil Emily and her two sons, Maximilian and Rupert. When his father dies, Fella is relegated to servant status. He meets his Fairy Godfather who transforms him into a handsome prince, where he whisks Princess Charming off her feet. 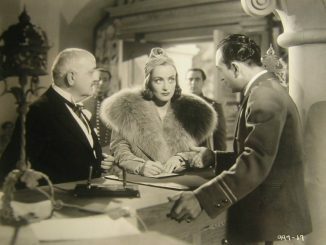 The Errand Boy, the third included film, is very similar to The Bellboy as it was quickly shot and really just several sketches and routines strung together by a thin premise of Lewis being hired as a “Paramutual Pictures” errand boy, unwittingly being used by the studio brass to spy on the different departments. Lewis used the entire Paramount backlot for all of his hijinks. Many employees were caught in the background and used for gags; and it was supposedly the most fun the entire lot ever had. This incredible package will supply endless hours (and days) of fun, enjoyment and fascinating research. Whether you are a Jerry Lewis fanatic or not, it should be included in any film lover’s library as an important addition, as well as convincing argument for Lewis’ recognition as a full-fledged comedy genius. I’m a convert, and I’m sold. Recreated “Being A Person” book: 96-pages made up of drawings and quotes inspired/written by Jerry Lewis and drawn by his personal illustrator. 250 copies of this book were originally made and distributed to members of the cast and crew of The Nutty Professor after the director heard of general conflicts among them. CD: Phoney Phone calls 1959-1972: Years before the Jerky Boys were harassing unwitting shop clerks, housewives and businessmen, Lewis perfected the art, as these recordings show. Released in 2001 on the Sin-Drome label, this is a collection of private prank calls secretly recorded by Jerry Lewis over the years. As a lifelong Lewis fan, glad to see you have an open mind and now recognize the value of his work. Enjoyed reading your take on this collection of Lewis gems and look forward to owning this set soon myself.